Home \ HIPAA Compliance Products & Services Store \ HIPAA & HITECH COMPLIANCE TOOLS \ Compliance Guide to HIPAA and the DHHS Regulations, 6th ed., and accompanying HIPAA Policies and Procedures Resource Center CD, 6th ed. Complying with the Health Insurance Portability and Accountability Act of 1996 (“HIPAA”) and the Department of Health and Human Services (“DHHS”) regulations can be confusing and costly. This Complete HIPAA Compliance Guide to DHHS Regulations is designed to help your organization understand all that is needed to become and remain HIPAA compliant. This HIPAA Compliance Guide and its accompanying HIPAA policies, procedures, and forms Resource CD enable you to become compliant as easily and cost effectively as possible. Combined with the HIPAA training video DVD and workbook or our online basic HIPAA training enables you to fulfill and annual training requirements. Nationally known HIPAA expert, Jonathan P. Tomes has used the compliance strategies outlined in this book with great success from huge government agencies to sole practitioner offices. This compliance guide explains the law so that you and your company can avoid criminal liability and civil money penalties. The Compliance Guide to HIIPAA and the DHHS Regulations now includes the Omnibus Rule; some may call the Mega rule, change requirements. The Resources CD contains more than 70 sample policies, procedures, and plans, all editable in Microsoft Word so you can easily adapt to your organization. You will receive our Risk Analysis ToolKit to meet the most important requirement and have the option of one of our national experts to review, report, and consult by phone to make recommendations for improvement leading you to determine which HIPAA Policies and Procedures must be implemented for your organization to meet DHHS requirements for HIPAA compliance. Including the new Omnibus rule (Mega rule) change requirements. 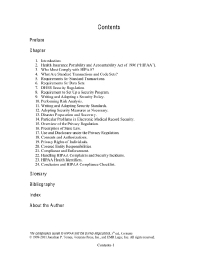 Updated explanation of HIPAA and the DHHS privacy and security regulations, standard transactions, and code sets with the new HITECH Act changes. CD of sample policies, procedures, contracts, forms, and much more. Risk analysis toolkit with emphasis on the fundamentals of ongoing risk management. If you prefer to order offline via phone, fax, or snail mail and want to print out the contact information and an order form to do so, click here.